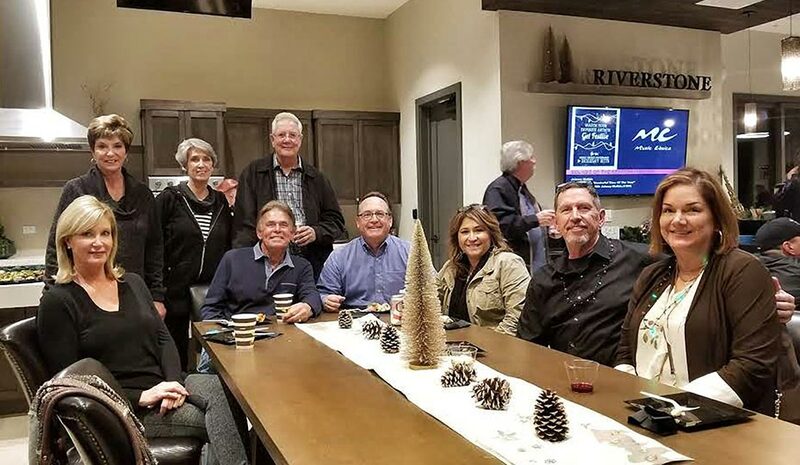 Life has always been about togetherness at the Madera County master-planned community of Riverstone, and it’s especially true during the Holidays. With exciting events and get-togethers planned for the entire month of December, homeowner families are getting in the spirit and enjoying the magic and warmth of the Holiday season. Some of Riverstone’s youngest residents enjoy a special visit from Santa during the community’s annual Holiday Party. 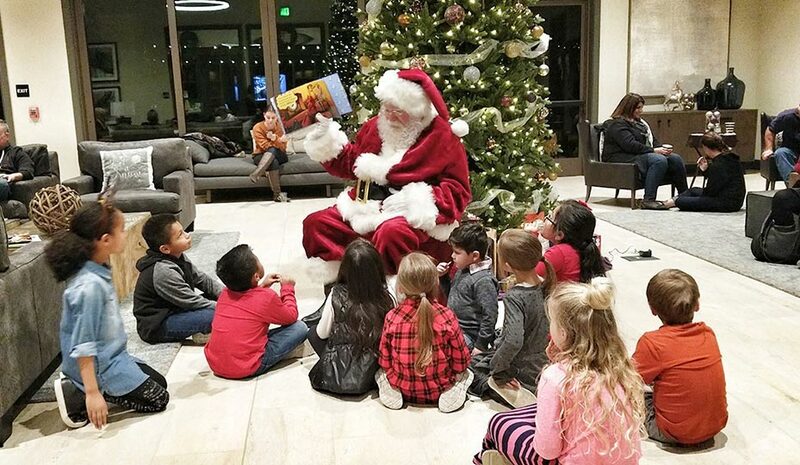 Riverstone’s annual Holiday party is enjoyed by all, as residents gather for festive food, drink and camaraderie at The Lodge community clubhouse. During the Holiday season, Riverstone families will have the chance to come together and savor the community’s Fall for Wine tasting event. The merry fun continues with three events planned for December, including the Winter Wonderland Mixer, the Santa & His Elves cookie decorating party, and Letters to Santa, a fun series of get-togethers that have already become a family favorite. Many of the community’s events take place in Riverstone’s “social epicenter”—The Lodge. Situated in the heart of Riverstone’s inaugural residential neighborhood called the Lodge District, The Lodge is a one-of-a-kind, resort-style community clubhouse with a distinctive contemporary-meets-agrarian architectural style. In addition to seasonal, community-wide events, the helpful Concierge staff at The Lodge is available to help residents plan their very own family celebrations—anything from a birthday or an anniversary to some other milestone. The Lodge at Riverstone joins the other completed amenities of the Lodge District, which include a number of community parks as well as collections of stylish, innovative new homes from D.R. Horton, Lennar and McCaffrey Homes. Also coming to the Lodge District are planned hiking and biking trails, a community farm, a dog park featuring separate entries and areas for small dogs and big dogs, and a brand-new elementary school belonging to the Golden Valley Unified School District. Within walking and biking distance from Riverstone’s new homes, the innovative school campus is planned to feature tech-forward 21st century classrooms, a state-of-the-art Library/Media Center, a dedicated music room, outdoor learning spaces, a large outdoor amphitheater and a dynamic sports complex. Excitement continues to grow for Riverstone’s planned shopping, dining and entertainment destination known as Riverwalk. Expected to occupy the southwest corner of Avenue 12 and Highway 41 within walking distance of Riverstone’s first collections of new homes, Riverwalk is anticipated to provide visitors with a truly one-of-a-kind, indoor-outdoor retail experience that celebrates the agrarian heritage of both Riverstone and the region. Situated in the heart of the region’s path of growth, Riverstone—when complete—will total approximately 6,578 single-family, attached and multi-family homes. The community also features a sustainable water supply and belongs to the award-winning Golden Valley USD. For more information about the new-home community of Riverstone and its collections of new homes from D.R. Horton, Lennar, McCaffrey Homes and Wathen Castanos Homes, homebuyers are encouraged to visit the community’s website at www.RiverstoneCA.com and add their name to the Interest List.